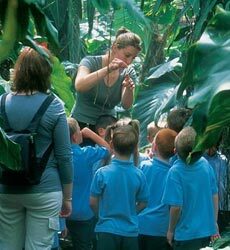 Join one of our fascinating guided tours to learn about the rainforest. Our expert guides will answer your questions and tell you about our amazing plants and animals, from insect-eating plants to tree-dwelling snakes. Tours are suitable for all ages. Tours take place daily on weekends and school holidays at 11.30am and 1.30pm. Please book at reception on arrival as spaces are limited. Tour costs are included in the normal admission price. On weekdays during term time, we also offer a new Afternoon Tour at 2.30pm for the general public. Please book at reception on arrival as spaces are limited. Tour costs are included in the normal admission price. Afternoon Tours take place after our acclaimed School Visits programme (pre-booking is needed and extra charges apply for school visits).